Recently I came across the stylish work of Rebekah Holguin [edit: shop is no longer active] via Pinterest. 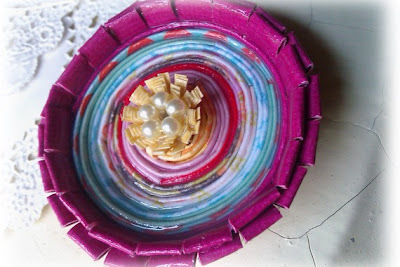 She has an approach to quilling that I find fresh and appealing. 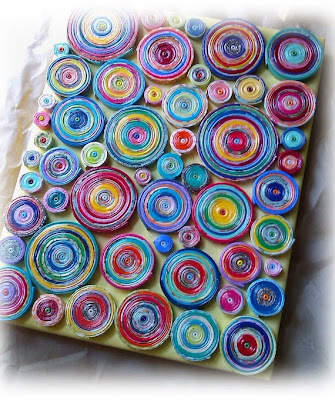 Rebekah combines printed pages and bright colors with common quilling techniques, like fringed flowers and rolled tight coils, to great effect. And of course it doesn't hurt that her photographs are lovely. I had a feeling it would be fun to interview Rebekah and wasn't disappointed. Read on to hear about her intriguing career... first and foremost she's a conceptual artist with experience working for a major film design studio despite her young age. I started almost six months ago. I'd never even heard of quilling before then, but noticed a piece of quilled art at my mother-in-law's house. I quickly became interested and learned there are tools, but never bought any - I figured I'd work it out for myself and am still very much learning. You jumped into opening your Etsy shop, The Pretties, fairly quickly then, and it's doing well - congratulations! 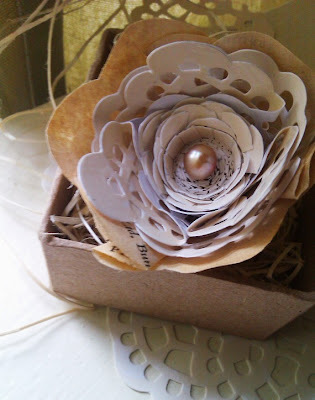 I opened it solely to sell my illustrations and then decided I might add a bit of jewelry... maybe some coils of bright paper, then quilled flowers....whatever idea hit me. 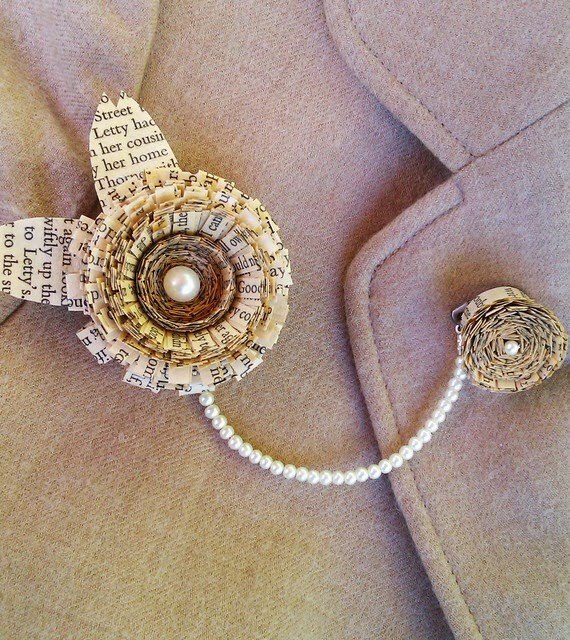 Etsy is definitely not a full-time job, but it might turn into one down the line. My freelance illustrating work is what takes most of my time; I'm illustrating two children's books right now. Not exactly, no. I did an internship while in high school for the New Zealand film studio, Weta Workshop, that made Lord of the Rings, Narnia, Avatar, etc., and was hired to stay on as a film designer after graduation. You could say I more or less learned on the job. You moved fairly recently to California? Yes, I married an American, and came to live out here from New Zealand. I began my Etsy shop because I didn't have a work visa and was bored out of my brain! A friend opened an Etsy jewelry shop - I realized it's the best community and had to get involved. 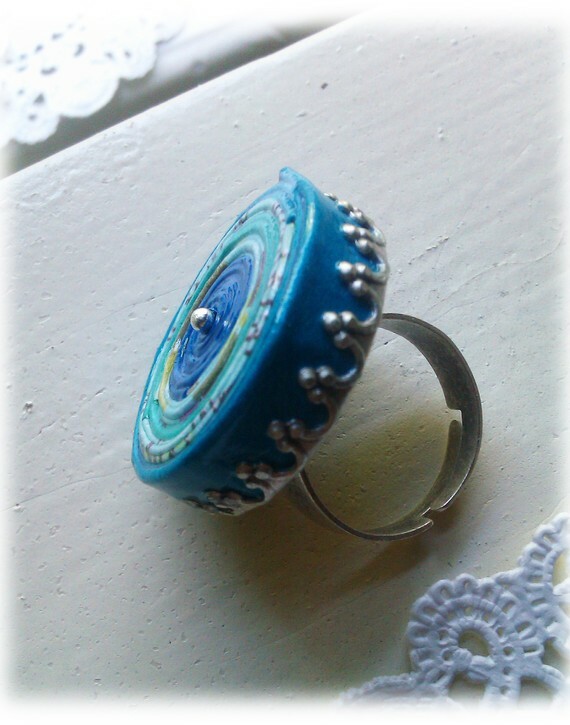 I never thought people would like the things I make - its a cool feeling! I also never thought I'd be doing this, but life's weird that way. Do you plan to sell your products in brick and mortar stores? I've sold a few things to boutique shop owners, but nothing serious at this stage. Being new to the country, I'm still learning what's what. Some of my stuff is a bit Anthropologie-esque, so a boutique that carries things like that would be the goal. You might enjoy this interesting interview [edit: no longer available] about Rebekah's conceptual art and what it was like working as a film designer for Weta Workshop just out of high school, not to mention being the only female at the time. 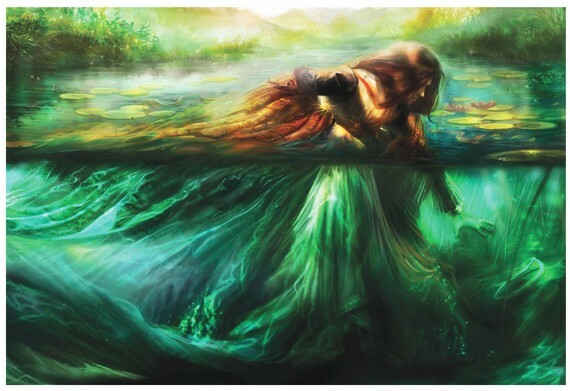 Rebekah's illustrative and conceptual art website [edit: no longer available]. An amazing illustrator. Her quilling is creative and eye-catching. Wishing her much success! Her fringed flowers and tight coils are eye catching I am impressed by the way the purple fringed flower has a folded strip on the outer circle. Her work is beautiful. 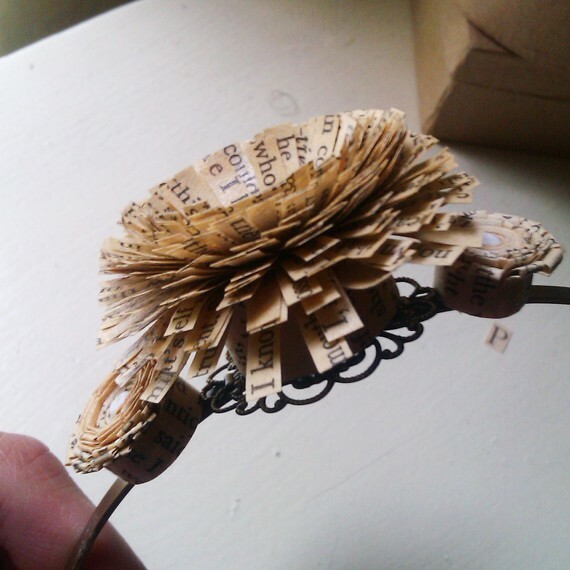 I especially love the flowers made from text pages. Oh my, Rebekah is a fabulous artist! 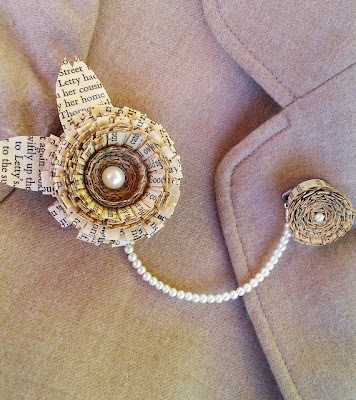 I couldn't help going back to look at the first pic with the string of pearls attaching the pieces. All amazing works! Yes, stylish. Going to check out her website. Thanks, Ann! i love from you Quilling Beautiful!!! 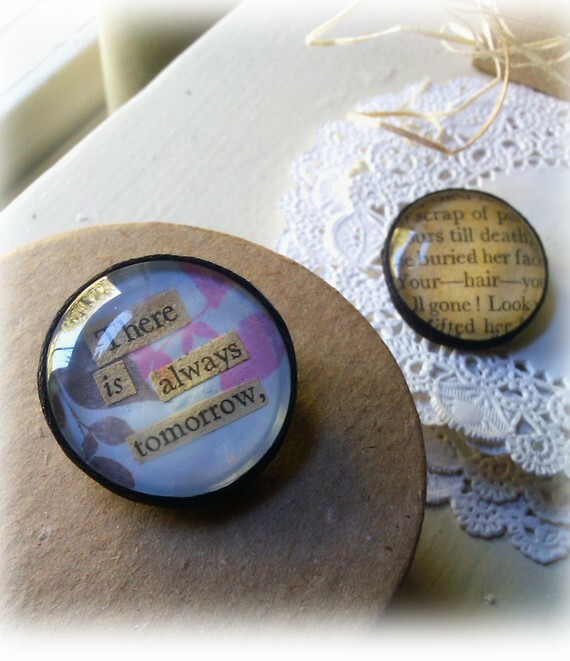 She has been on my etsy "favorites" since I first saw her work. I love her use of old text pages. Makes me want to go out to an old book store and tear and shred to my heart's delight. Thanks for another fab find, Ann! 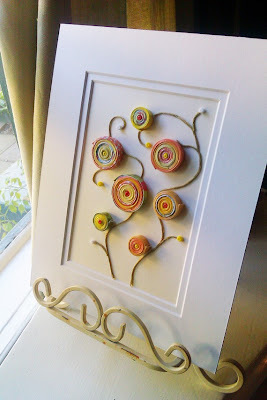 I love Rebekah's idea with the quilling technique...very different and wonderful. I love this amazing artist! Thanks for sharing her work and a bit of her personality! Oh Ann... thanks for making me spend money!!! :) I loved Rebekah's shop.